I’ve often been called “The Shoulder Guy” because I write about it so much, but the truth is, I learned about shoulders because mine are a disaster. My shoulder MRI features a rotator cuff tear, labral fraying, and a cartilage defect. Sounds brutal, right? Well, it might surprise you that I’ve bench pressed over 400 pounds, regularly deadlift over 600lbs, and can throw with my professional baseball guys whenever I want. You see, if you teach a shoulder to move well – establishing mobility and stability in the right places – you can “get away” with having a lot of accumulated wear and tear at this important joint. With that in mind, I thought I’d use today’s guest post to offer you some training technique advice and programming strategies to bulletproof your shoulders. Include a wide variety of pressing movements. Everybody loves the bench press – and that’s completely fine; it’s one of the best “bang for your buck” exercises you can do. Unfortunately, when your upper back is always pinned to a bench, your shoulder blades can’t rotate freely – so they may lose the ability to get to positions you need to safely train pain-free. With that in mind, it’s important to complement your bench press variations with other movements where the shoulder blade can move freely. Cable pressing exercises are awesome, and you can even benefit greatly from overhead pressing. Try rocking bottoms-up kettlebell pressing variations if you’re worried about testing the waters with something more aggressive in this regard. The bottoms-up set-up creates a more unstable environment, and reduces the amount of loading you need to achieve a training effect. 2. Don’t neglect the rotator cuff. 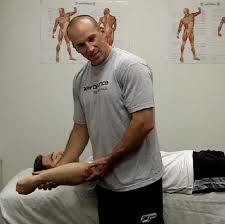 There are a lot of asymptomatic shoulders out there who have really messed up rotator cuffs. In fact, one study showed that 34% of people with ZERO shoulder pain actually have rotator cuff tears – and this number is actually 54% in those over age 60! Just because you don’t have shoulder pain doesn’t mean that you don’t have something “wrong,” or something about to go “wrong.” Rather than just waiting for those symptoms to kick in, try heading them off before they occur. 3. Dominate the back-to-wall shoulder flexion exercise. We teach this to just about every new client at Cressey Sports Performance. It’s not only a training exercise, but also an assessment. If you can’t get your arms overhead without compensating with lower back arching or forward head posture – or winding up in pain – then it’s a sign that you’ve “lost” an essential movement pattern. Practice this! You’re probably hunched over a computer reading this. Joking aside, you’ll be happy to know that you’re not alone. There are a lot of people out there – avid lifters included – who are acquiring a hunchback posture because they’re always in a rounded upper back position. Fortunately, I’ve got two exercises for you to help address the issue! I see many shoulders that are just as ugly as mine on a weekly basis, but they’re usually a lot more painful than mine – until they follow some of the exercise strategies I outlined for you in this article. And, more importantly, they thrive when they get into a well-balanced strength training program. Looking to take the guesswork out of programming? 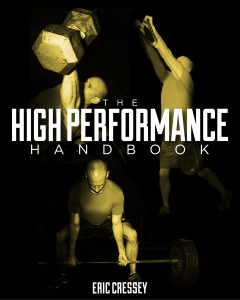 Check out my new resource, The High Performance Handbook. It’s on sale for the first time ever this week, so here’s your chance to improve your posture, physique, and athleticism for $50 off! Eric Cressey is the President of Cressey Sports Performance, with locations in Jupiter, FL and Hudson, MA. An author, presenter, consultant, and powerlifter, Eric has worked with clients from youth sports to the professional and Olympic ranks. Eric publishes a free blog and newsletter at www.EricCressey.com.